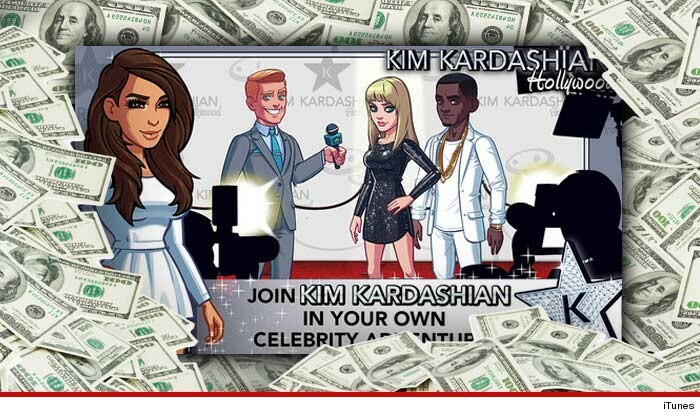 Kim Kardashian $85 MILLION WINNER In KK Video Game! Kim Kardashian stands to make around $85 MILLION from the new video game iPhone app that boasts her namesake ... more than she made last year in all of her other ventures combined ... TMZ has learned. Sources familiar with the deal tell TMZ ... Kim's cut is 45% of net profits. The game -- "Kim Kardashian: Hollywood" -- is set to gross a reported $200 million this year alone. We're told the actual expenses associated with the business are relatively low. A straight 45% cut of $200 million totals a whopping $90 million. Industry sources tell TMZ ... expenses would not exceed $10 million. So ... we're no mathematicians, but 45% of $190 million is $85.5 MILLION FREAKING DOLLARS. To put this in context ... according to Forbes, Kim made $28 million last year. As you know ... the game is all about becoming a virtual celebrity, but it costs real money to buy your way to the top. Now the bad news for Kim. We're told she has to pay her agent, Uncle Sam and, of course, Kris. Dentist Tries to Make Killing Off Kim Kardashian's Mouth!